Immaculee Ilibagizagrew up in a country she loved, surrounded by a family she cherished. But in 1994 her idyllic world was ripped apart as Rwanda descended into a bloody genocide. Immaculee's family was brutally murdered during a killing spree that lasted three months and claimed the lives of nearly a million Rwandans. It was during those endless hours of unspeakable terror that Immaculee discovered the power of prayer, eventually shedding her fear of death and forging a profound and lasting relationship with God. She emerged from her bathroom hideout having discovered the meaning of truly unconditional love-a love so strong she was able seek out and forgive her family's killers. The triumphant story of this remarkable young woman's journey through the darkness of genocide will inspire anyone whose life has been touched by fear, suffering, and loss. This is Immaculee's first book. Customer Reviews For "Left to Tell"
Informative & easy to read. Out of stock at present but available in West Australian Libraries. Due to graphic descriptions of genocide killings, only suitable for Mature Reader, OR PG REQUIRED. The main story is of her amazing spiritual journey, forgiveness, great faith & trust in God. 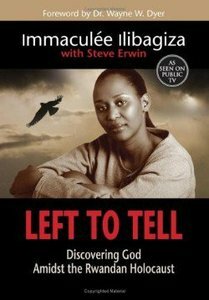 Her 2nd continuing book, Led By Faith, is also very good but I recommend Left to Tell be read 1st.